Everywhere, but here, it’s nearly spring and to me, that means the start of about 5 solid months of prime picking at yard sales and flea markets that only intensify in number as the warm weather returns and the temperature rises. Ah, picking season! There is, of course, thrift stores and estate sales for the colder months and they certainly give me my fix, but there’s something about getting up early on a beautiful weekend and spending the day roaming from one garage to the next. It feels like there’s more possibility for finding that perfect something when it’s organic and personal; sifting through treasures from someone’s attic as opposed to scanning endless shelves of corporate coffee mugs and tight, overstuffed racks of polyester clothing. Again, they have their time and place, but being sequestered indoors for much of the past 4 months while the layers of ice on the pavement and roads grew thicker by the day and where the temperature has, frequently, been in the single digits and lower, thinking of picking season and the outdoor hunt for kitschy finds is where my heart is these days. On a whim, this past weekend, my wonderful femme friend, Charlotte, and I went to an estate sale and then to a little vintage shop where its vendors were having discounts all day long. We didn’t clean up, per se, but we didn’t do badly either. It was a nice first return to picking and a reminder that warm, green days are ahead of us. 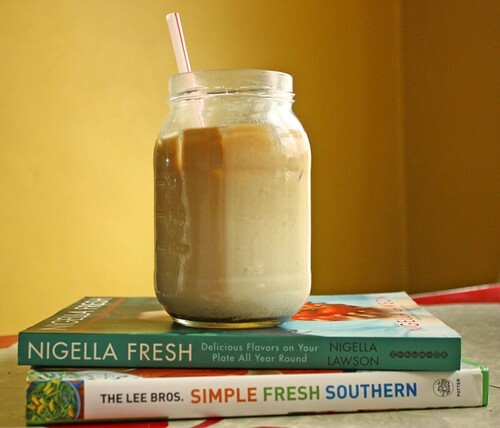 I wound up with two great cookbooks – The Lee Brothers’ Simple, Fresh, Southern and Nigella Lawson’s Nigella Fresh – and a vintage GlasBake split casserole dish. The cookbooks are especially fitting because I am in love with the slowness and the comfort of Southern cooking lately and because Nigella Lawson, well, she’s just pure femmespiration. The cookbooks and the casserole dish were from the estate sale, on it’s very last day, and so everything was criminally cheap. The vintage store we went to, Flamingo’s Divine Finds, (pause to note the amazing homage that Flamingo’s is to femme queen extraordinaire, Divine) was overflowing with repurposed furniture and tons of vintage kitsch. Though the prices were at least double those of a standard yard sale, they were still plenty reasonable, plus the vendors and owners alike were so warm and gave us a few dollars off each item we purchased without any serious haggling on our end. 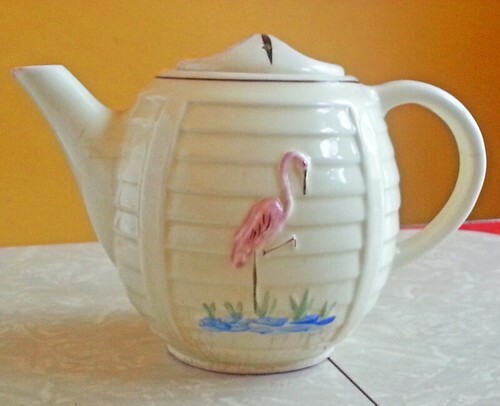 I couldn’t resist this adorable vintage teapot with a flamingo on it, both because I have a thing for quirky teapots and because how else do you commemorate a trip to a place called Flamingo’s Divine Finds without it? 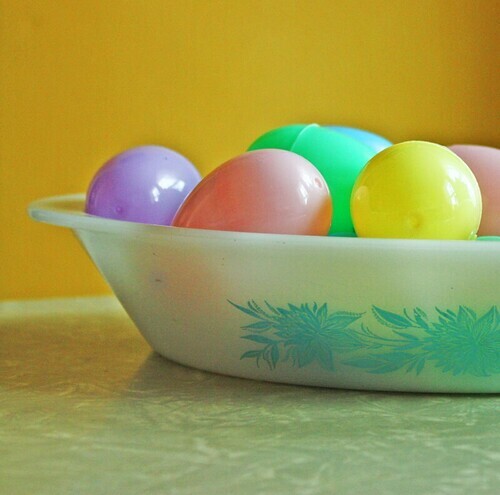 Pickers among us, what’s on your springtime “to thrift” list? Do you have a particular item you’re going to be searching for?